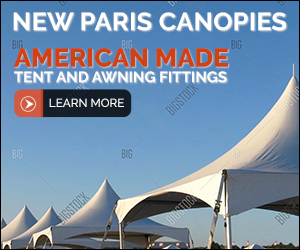 New Paris Canopies has been in business since the mid 1960&apos;s. We are proud to say that we use only American made Steel on all of our products. We are family owned and take pride in our work and service. We design, build and manufacture all of our products right here in Indiana. We have many different facets to our business. -Custom made canopies-Custom made fittings-Plant stands-Beverage stands-BBQ trailer, custom made and is great for tail gating partiesGive us a call to discuss your needs and let one of our experts direct you in the right direction. You can be the envy of any party or function with our custom designed items.